Today I want to talk about content repurposing and the importance of doing that piece of work early in your planning phase. I see so many times where brands have invested so much money in creating usually heavyweight, dense pieces of content but haven’t taken the time to think about how that content can be re-purposed across a number of different formats. And what that does, is limit their ability to leverage that effort and resource that’s gone into creating that content. 1. How do we actually want this content to be utilised? 2. 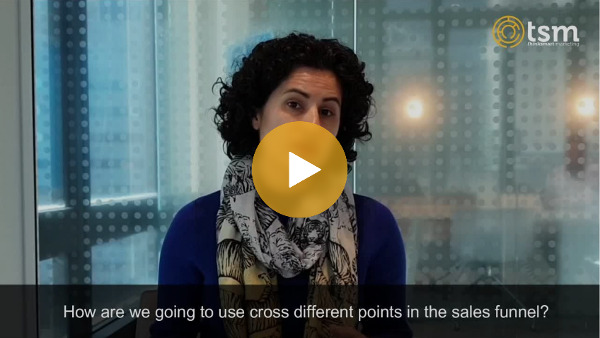 How are we going to use cross different points in the sales funnel? 3. How do we go beyond top of funnel content but extract elements of it that can be used as mid funnel or low end pieces? 4. How are people engaging with the content? 5. What channels do we need this content to sort of work across? Because that will absolutely impact the format it is creating. And if we do all that work and strategise effectively in the planning phase, then you can greatly improve production efficiencies. You can ensure that when you’re planning the content, you’re hitting all the key points that you need to for written content formats, visual content or graphics, for animations, etc. It means that you’re reducing the hard work along the process so by the end of it, you’re left with a number of different content formats, utilising less budget than you would have if you’d scope them out individually. So that’s content re-purposing, its something that’s super important for everyone to be doing, giving you leverage over your budget and utility. But always remember to do it in the planning phase.